We are a clinical-stage biotechnology company specialized in the discovery and development of medicines with novel modes of action, addressing disease areas of high unmet medical need. Our pipeline comprises programs ranging from discovery to Phase 3 clinical trials in inflammation, cystic fibrosis, fibrosis, osteoarthritis and other indications. Our highly flexible platform is applicable across many therapeutic areas. 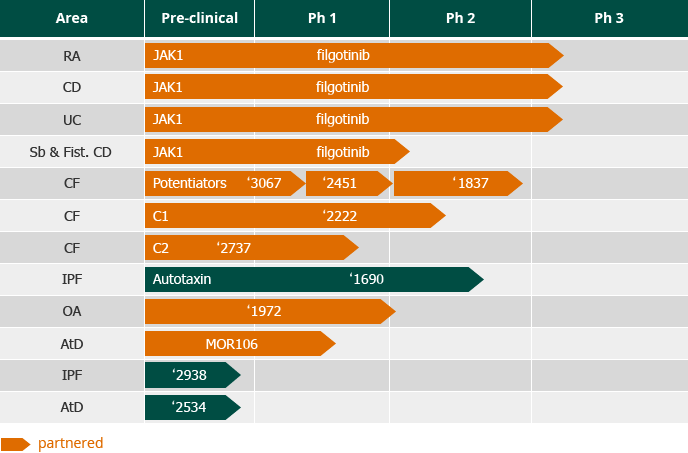 Our clinical stage programs include: filgotinib, which is currently in Phase 3 clinical trials in rheumatoid arthritis (RA), Crohn’s disease (CD), and ulcerative colitis (UC); our cystic fibrosis (CF) portfolio of drugs aimed at a triple combination therapy for 90% of CF patients, for which we plan to initiate patient clinical trials by mid-2017; GLPG1690, our fully proprietary autotaxin inhibitor, which is concluding a Phase 2a trial for idiopathic pulmonary fibrosis (IPF); GLPG1972 for osteoarthritis (OA), which is expected to be dosed in a Phase 1b trial in U.S. patients in 2017; and MOR106, which is currently being dosed in atopic dermatitis (AtD) patients in a Phase 1b trial. Except for our CF program, these programs are derived from our proprietary target discovery platform.